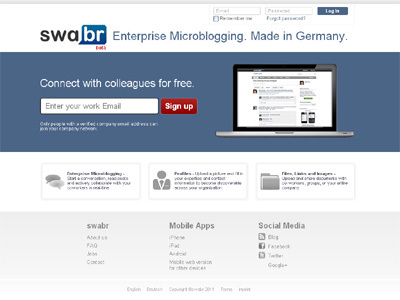 swabr is a free, easy & intuitive enterprise microblogging service for companies and organizations. We are different! swabr concentrates on the single functionality for a simple and fast way to communicate by offering an enterprise microblogging service which is easy & intuitive to use. All other competitors wants to implement a bunch of functions which leads to an enterprise market with multi-complex systems. swabr is easy and intuitive to use.